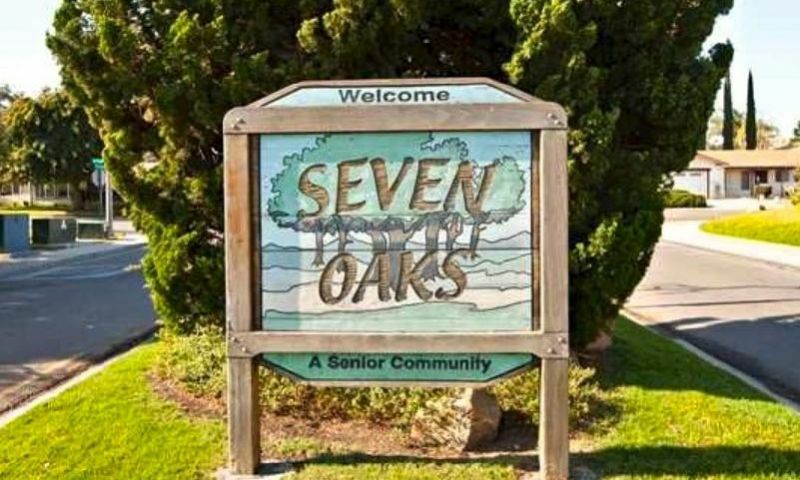 Seven Oaks is a large 55+ community in San Diego, California. Constructed between 1964 and 1974, Seven Oaks is now host to 1,700 single-family and attached homes. This well-established active adult neighborhood boasts an impressive community center where residents stay physically and socially active. The community center within Seven Oaks provides a balance between indoor and outdoor amenities, allowing residents to pursue hobbies and take advantage of the beautiful Southern California climate. Located in the northern part of San Diego in the master-planned community of Rancho Bernardo, Seven Oaks is near golf courses, shopping, and world-class restaurants. Seven Oaks is also located less than two miles from Oaks North, a similar 55+ community that has a wide assortment of homes and amenities. The Community Center is the heart of Seven Oaks, where residents gather to meet fitness goals and socialize with neighbors. The Community Center has an exercise room for working out, while hobby and meeting rooms host resident get-togethers. Picking up a new pastime is easy with an arts and crafts studio and woodworking shop on hand. Seven Oaks also features an auditorium for performances and a library and billiards table for enjoying a relaxing afternoon. The terrific amenities continue outdoors with a pool, spa, and patio. There is a beautiful courtyard, where residents gather to catch up with each other. Seven Oaks also provides a tennis court, ten shuffleboard courts, and walking and biking trails to help you stay in great shape. Golfers can hone their skills with the putting green before relaxing in the lush park space found throughout Seven Oaks. Seven Oaks was constructed between 1964 and 1974 and now contains approximately 1,300 single-family homes and 400 attached units. The attached units are available in the Haciendas neighborhood and range in size from approximately 900 to over 1,400 square feet and generally have two bedrooms, two bathrooms and carport or garage parking. All of the attached units feature single-level living while most include enclosed patios and granite countertops. Most of the real estate options within Seven Oaks are single-family homes. These homes range in size from 950 to over 2,000 square feet and have at least two bedrooms, two bathrooms and an attached one to two-and-a-half-car garage. Most homes offer beautiful private yards, granite kitchen counter tops, and stainless steel appliances. The homeowners' association (HOA) fee varies according to type of home. For attached homes, residents pay a reasonable fee for community club membership, exterior landscaping and common area maintenance. For most single-family homes, residents do not pay an HOA monthly fee, just a low annual payment for access to the community amenities. Living within Seven Oaks means having plentiful clubs, groups, and events to attend. Diversify your exercise routine with yoga, water aerobics or line dancing. Special interest groups include the book club, playgoers, and even a group specifically for retired nurses. Explore a new hobby with the stained glass group, woodcrafters club or needle arts. From hiking to art to Tai Chi, Seven Oaks will have plenty of activities to keep your calendar full. Seven Oaks is located in San Diego, California. For everyday conveniences, Seven Oaks is just down the street from Albertson's, Rancho Bernardo Town Center, and directly behind the community is The Plaza shopping center. Residents will find the Scripps Memorial Hospital conveniently located just 20 miles away. Interstate 15 and the San Diego International Airport are both just a short drive away. Seven Oaks' location within San Diego makes it a great choice for recreational enthusiasts. The region is renowned for its state parks, hiking, and miles of beaches. The golf enthusiast will love the 18-hole golf course at the Country Club of Rancho Bernardo right across the street. Lake Hodges and Miramar are just a few minutes away while downtown San Diego provides museums, boutique shops, and historic sites to explore. Seven Oaks is a terrific active adult community that combines world-class urban attractions with quiet neighborhood living in San Diego, California. There are plenty of activities available in Seven Oaks. Here is a sample of some of the clubs, activities and classes offered here. Seven Oaks has approximately 400 attached units. Available in the Haciendas portion of Seven Oaks, these units range in size from approximately 900 to over 1,400 square feet and generally feature two bedrooms, two bathrooms, and a carport or garage parking. Please Note: Not all floor plans are available at this time. Seven Oaks hosts approximately 1,300 single-family homes. These homes generally range in size from 950 to over 2,000 square feet and have at least two bedrooms, two bathrooms and most have a one or two-and-a-half-car garage. Please Note: Not all floor plans are available at this time. 55places.com is not affiliated with the developer(s) or homeowners association of Seven Oaks. The information you submit is distributed to a 55places.com Partner Agent, who is a licensed real estate agent. The information regarding Seven Oaks has not been verified or approved by the developer or homeowners association. Please verify all information prior to purchasing. 55places.com is not responsible for any errors regarding the information displayed on this website.